After last nights looong post, I thought something quick and bright was in order! These are all phone photos I’ve taken for the Phone Photography Project. It’s my goal to do one every day the class goes on! I’ve never had such an easy time keeping up with classwork. Follow me on Instagram if you want to see them as they happen! I’m not sure if it’ll be redundant to share these here weekly, since I’m sharing them on social media daily, so I’ll let you all vote if you’d like me to share weekly in the comments section. Otherwise, I’ll just do a collage at the end. And if you have any questions about the content / how I’m liking the class, feel free to ask! Here’s what’s going on in the photos. 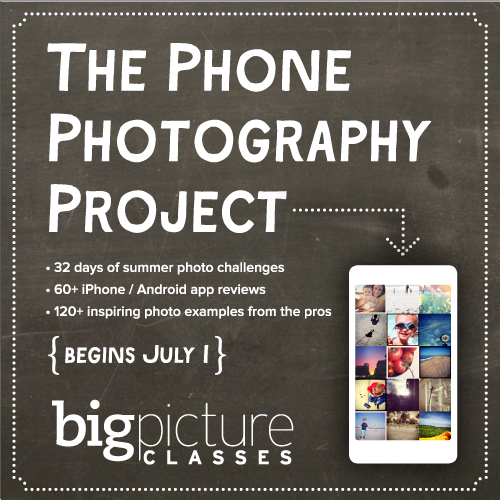 I’m taking the Phone Photography Project, which closes for registration July 10, c/o Big Picture Classes. We’re BPC affiliates because (obviously) I’m sort of obsessively in love with them. Purchasing anything at BPC through our links helps support the Nerd Nest! Not having natural pretty light makes things super hard and uninspiring. I take WAY fewer photos in the winter for that reason. Loved your tap / jump photo, btw! Awesome goal, Jen! I love photo a day challenges. Glad to know that you won’t be all, ugggghhhh not this stuff again! And true, it is one of the easiest posts. Because for some reason, I can’t seem to think of simple ones lately. They’ve been craaaazy. Also, my favorites don’t really reflect this, but Oz is probably my favorite. And Tara. Willow has good taste.